Amid an array of colorful paintings and sculptures, an unusual art project is taking place at UNTITLED in Miami Beach. The Truth of the Labyrinth, a project by Julien Friedler, asks fair goers to respond to a series of philosophical musings written by the Belgian artist. The air travel-adverse Friedler has dispatched two assistants to the fair, video cameras in hand, to record the conversations that arise from his whacky prompts, which touch on such subjects as globalization, the prevalence of money in society, and the existence of a higher power. They will be working at the fair all week. artnet News was asked to respond to text 2, which posed the question: "could art one day serve as a refuge from the noise and the rage within?" Mmmmm okay. For Friedler, discussing such lofty ideas is a work of art, albeit one that has no object or physical dimension. The conversation itself is enough. 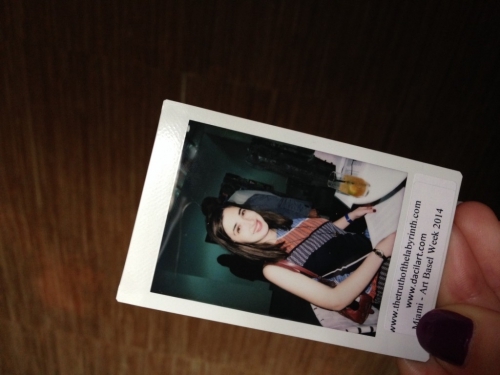 The only memento of the experience that participants come away with is a Polaroid of themselves. Friedler's quiet, contemplative work stands in contrast to the conspicuous consumption everywhere in Miami this week. It offers an opportunity to reflect on what really motivates artists. More than money, more than fame, the initial impulse to create is based on the desire to express something the artist believes is true.